With their king-like presence, the Chow Chow is not one to scare off easily. They are defensive of strangers in their home, and can be extremely protective creatures. While chows are known to be very set in their ways, they do have the ability to peacefully share their home with other pets without any issues. Chows are not performing dogs as they prefer to be quite stern or serious canines. One stand out quality of chows is that they are unbelievably loyal dogs, always serving their owners safety. Chows are born in both short and long hair breeds, making caring for their fur coats a personal preference when choosing the ideal chow. Their fur can be rather thick and when owning one of these long hair chows, you must be able to commit to brushing their coats a minimum of twice per week. For the chows that possess a short hair fur coat, they need brushed less but will require additional attention during those months when they shed heavily. They only need a bath when you feel it is needed as they are generally very clean creatures. All of the regular routine maintenance such as trimming their nails and good dental health needs to be handled weekly as well. Chows can reach a weight of around fifty five pounds, and will need some form of training to steer clear of them becoming too aggressive. They need a good run at least a few times per week, or a daily walk as they are active canines that crave a fair amount of exercise. Chow Chows can develop an ailment called Entropion, which occurs when the eyelids begin to collapse or become introverted due to the dog’s eyelashes touching the eyes regularly. They can also develop CHD or coronary heart disease. This is very serious and can result in a heart attack, deeming it crucial to seek the guidance of your vet should your chow begin to experience any irregular heartbeat or abnormal palpitations. Cataracts, gastric torsion, elongated palate, elbow dysplasia and patellar luxation are all commonly found in chows as they age as well. Vets may recommend testing for the canine’s hips, elbows and eyesight over time. Average lifespan of a Chow Chow is eight to ten years. The Chow history originates from China, for centuries as a terrific hound for hunting purposes. Upon the decline of the hunting era in these regions, the chows popularity declined, but they were still represented in households of the elite as well as in monasteries. With their distinctive black or blue tongues, the chows are easy to point out and their fur was even previously utilized in places such as Mongolia many years ago. They were given the name Chow Chow once they grew in population in the United Kingdom around the 1700 century. Queen Victoria herself took a fond likeness to the breed and it began to blossom from there to earn the AKC recognition in the early 1900’s. 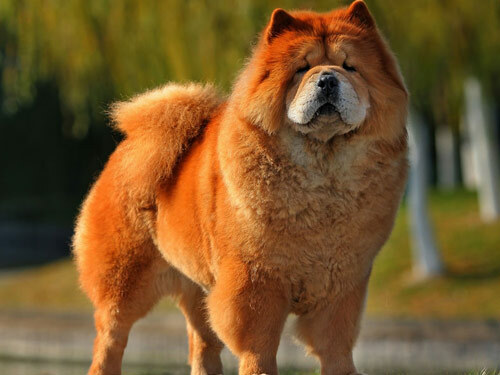 Chows tough exterior and bear-like appearance has soared their population in the states, climbing to reach a common breeding level of the number sixth most desired hound.